Following the recent first agreement in Spain to collect the ancillary copyright for publishers between Cedro (Spainsh Center for Reprographic Rights) and the German news aggregator Upday, Xnet points out that the deal is not really an “agreement” between guilds, but a circular interest operation. A simulation to benefit the publishing industry and its lobbying pretentions in the Eropean Union, by presenting the “Google Tax” (or “Canon AEDE” as it is known in Spain) as a workable idea. Again, “the authors” and their rights have little to do. The company Upday belongs to the German publisher group Axel Springer, who in turn is a beneficiary as publisher of the “Google Tax”. 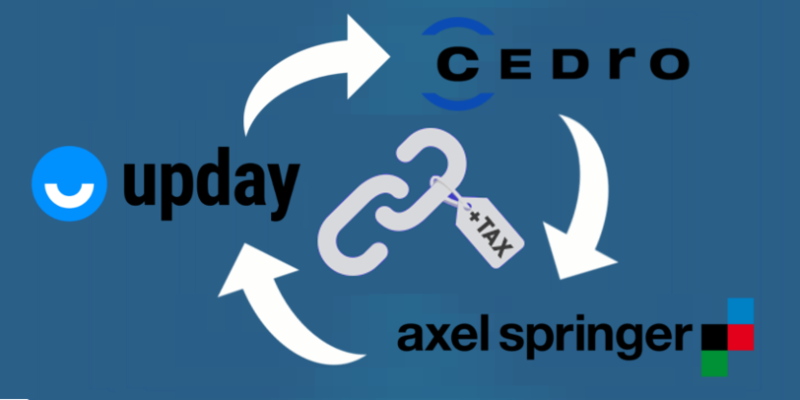 Thus, not only part of the money paid by Upday could end up coming back to the same Axel Springer group, but the group has an obvious interest in putting in motion the collection of the tax in Spain by setting precedent with this first payment. As put by Copyright for Creativity: “it is a left pocket, right pocket operation”. Cedro’s legal director, Díaz de Olarte, states that “We are optimistic because we have not found a frontal rejection and because a major effort has been made to ensure that what can be offered to these aggregators does not impede the development of their activity. Instead, a balance between the two parties has been sought.” To this statement, Xnet responds that said balance does not exist when both parts are the same one. A news aggregator owned by an publisher endorsing a tax to aggregators in favor of the publishers. The circle of interests closes around the monopoly of the major publishing industry with a law fitted to their wishes, while digital native companies are forced to close (and no, we are not talking about Google, that is able to survive without problems, we are talking about your small news blog or the new social app that is yet to come and may never be). The timely agreement comes in a very significant political moment. An ancillary copyright for publishers has been proposed in the Article 11 of the EU copyright directive reform, even though such measures have previously failed in the Member States where they have been implemented. In Germany, the media themsleves renounced the compensation, after seeing the loss of visits when the aggregators decided to disindex them to avoid having to pay the tax. In Spain, where the so-called “Canon AEDE” is unrenounceable, it has caused the closure of several news aggregators in face of the legal uncertainty, including Google News. The link tax in Spain resulted in a negative economic balance for publishers, according to this report of the AEEPP (Spanish Association of Publishers of Periodical Publications). The recent payment agreement in Spain seeks to give a false impression and an example for the feasibility of a “Link Tax” in the European Union just before the most important debates on the issue are going to take place in the European institutions during the next months. Diaz de Olarte himself pointed out that the future new European directive in the digital field “goes in the line of recognition of the rights of periodical publications“. A European link tax would economically damage the diversity of the Internet ecosystem. The plurality of news and opinions, a broad access to these news and opinions and the ability to share them, is important for the debate in a modern democratic society. Xnet and many other organizations in defense of freedom of information and digital rights show our oposition to this tax idea, as well as have expressed their opinion against it media from the AEEPP and recently el País. The details of the agreement between Cedro and Upday regarding the quantities are not yet known. Article 32 (2) of the current consolidated text of the Intellectual Property Law, in force since January 1, 2015, did not specify the amounts to pay for links accompanied by “non-significant content fragments”. In July 2016, Cedro rated at 0.05044854€ per active user/day the amount to be paid by news aggregators. This rate would mean, for example, 2.5 million euros a year to be paid by the aggregator Menéame (similar to reddit at a Spanish level), a totally disproportionate amount since in 2015 it had a turnover of 125,000 €, meaning it would probably have to close. However, it is reasonable to think that Upday is willing to pay higher rates, bearing in mind that it also means a compensation for the Axel Springer group, as it would also receive revenue from the tax to the aggregators. Finally, it should also be noted that Upday is developed as a co-alliance between Axel Springel and Samsung, and that several phones of this brand have it factory pre-installed, another practice of doubtful respect for competitiveness.